Here you can find some related newspaper articles. Click on the preview pictures to see the enlarged version. 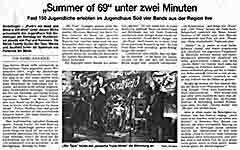 30.04.2002 - Kreiszeitung "Böblinger Bote"